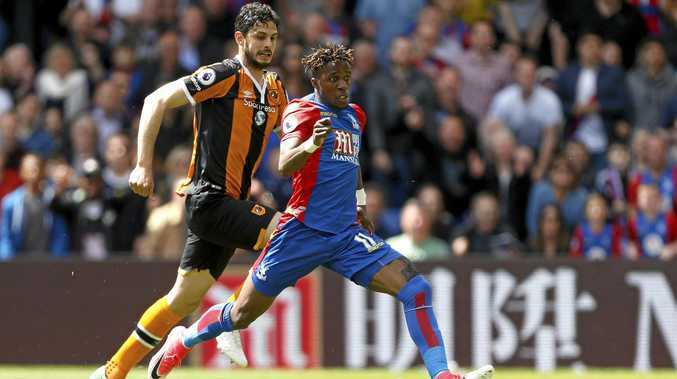 FOOTBALL: A 4-0 defeat at Crystal Palace means Hull City will be playing in the English Championship next season following relegation from the English Premier League. Goals from Wilfried Zaha, Christian Benteke, Luka Milivojevic and substitute Patrick van Aanholt also meant Palace survived the drop alongside Swansea City with one more game to be played. Marco Silva's side went behind after a shocking error just two minutes and 11 seconds into a game they needed to win to give themselves a fighting chance of survival. Italy defender Andrea Ranocchia missed a simple clearance, allowing Zaha to run clear and score. Benteke's header doubled Palace's lead and the win was completed thanks to late goals from Luka Milivojevic, from the penalty spot, and van Aanholt. Goals from Victor Wanyama and Harry Kane earned Tottenham victory over Manchester United in the final game at White Hart Lane as Spurs secured second spot behind EPL champion Chelsea. Spurs plan to have their new stadium, built on the same site, ready for the 2018-19 campaign and will play their home matches at Wembley next season. Defeat means Jose Mourinho's men cannot now finish in the top four. Liverpool beat West Ham at London Stadium 4-0 to move back into third place as striker Daniel Sturridge scored his first goal since January. Manchester City has a game in hand and can overtake the Reds but a win over Middlesbrough on the last day of the season will ensure at least fourth for Liverpool and a guaranteed Champions League spot.